Marley is one of the nicest dogs I have ever met. I walk by him every single day and he always wags his tail and acts genuinely happy to see me. It's a pleasure to walk by this yard and see “Marley.” Of course Marley isn't his real name, it's just the name I call him because he is such a happy, lovable guy. And, he always loves the treats I bring him. 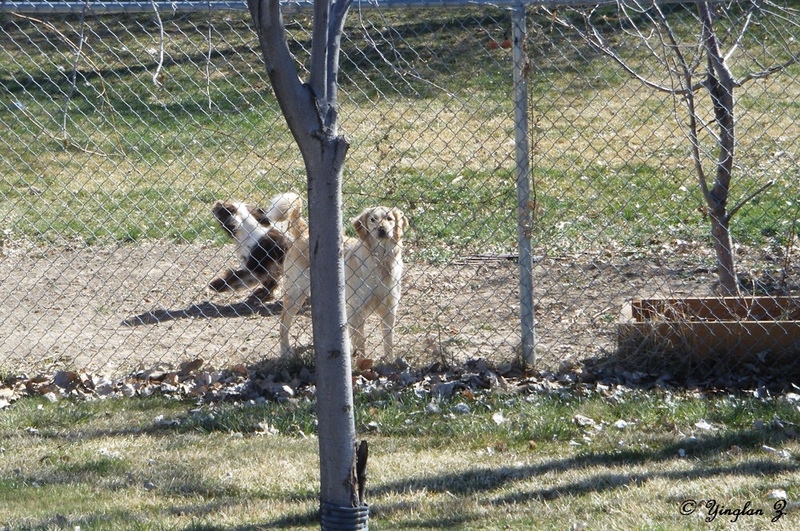 As I walked by Marley today, a litter of puppies came bouncing out rambunctiously. I had to laugh when I realized that my Marley is actually Marlena. 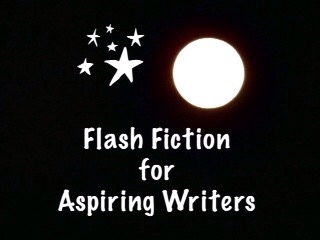 This is my 100 word entry for the flash fiction challenge, Flash Fiction for Aspiring Writers. We are given a photo prompt each week, along with 75-175 words with which we create our stories. This challenge is open to everyone who would like to participate. For more information, click HERE. Thank you so much Terri! I agree. Marley is a unisex name but I needed a good ending. LOL! Hahaha! Your ending was fab 🙂 Hope your July 4th holiday was fun! Thank you Terri and I hope your 4th of July was wonderful! A nice funny one, I like it! And that’s happened to me, too. For some reason I always assume dogs are boys and cats are girls; which means I’m wrong about half of the time, duh! Hahaha! That’s funny! You would be wrong half the time. LOL! Yes, I know what you mean. Golden retrievers are great dogs, I hear. Very cute story! I love the way you showed how much she loved the dog and even decided to name him…and the fact that He turned out to be a She! Thank you Rosey! It was fun to write. Ah, that ‘s so sweet!! Thank you so much Oliana! Hahaha! Did the cat end of having kittens that you didn’t know about? Awwww! Joy, I love when everyday routine occurences bring us comfort. It’s very nice when that happens! Thank you so much! Isn’t there something so comforting about a dog who is happy to see you???? Yes! It makes you feel truly loved and appreciated! LOL! As we all have. It’s easy to automatically assume a dog is male when it’s female and vice versa. Thank you Jodi! Very sweet tale. Rambunctious is well placed too! Thank you Graham! I wondered about that so thank you for letting me know. Awww, Marley and Me. Cute story. LOL! This was so cute, PJ. And I think it’s happened to the best of us, when a Charlie becomes a Charlotte or in this case, a Marley becomes a Marlena! LOL! Yes, that is very true. Thank you Jade! This would be a very simple mistake to make when you look at a dog. I make it with plenty of cats 🙂 Great story. Yes, I agree! I think we all make that mistake. LOL! Aw, such acute story. It brightens the main characters day to see this dog and the puppies would be so cute 🙂 Great write PJ. Thank you Mandi! It was fun to write. Love those kind of stories! Thank you so much! You’re welcome and it’s my pleasure! That’s true! That happened to me once. I have gained animals by doing this more than once. Did you get some of your cats that way? My oldest two were find in the middle of a dirt road in West Virginia when they were four weeks old. They were left for dead (no food or water). They don’t have cat shelters where we were so they came home until we could find a home for them. 15 years later..they are still here. I have acquired a half grown white cat that walked up to the house in October. But in another house, two dogs found a home through me. That’s so sad that they were left for dead. Thank goodness you took them in. Your white cat came to you in October and has found a good home. I know about feeding animals and they adopt you as their owner! I think that is what happened with this ferrel cat I have been feeding. I was giving my neighbor’s dog treats through the fence and before I knew it, the dog was in my yard. I have a 6 foot fence. I don’t know if the dog climbed the fence to my yard or if the neighbor put her in. All I know is I had a hard time getting him to come and get her out of my yard. It was a short squatty pitbull. Well, she wouldn’t be able to bounce through my fence but she could have come over the top, but I doubt it. I think her owner was wanting to get rid of her. After he FINALLY came over and got her he just let her go free to run the streets and get picked up by animal services. I have no idea what happened to the dog but it wasn’t a friendly dog. I imagine she didnt’ have a good outcome. And, he wasn’t going to come get her until I told him she growled at me – which she did. You’re right. This dog was probably not socialized. It’s a shame people get these dogs to e guard dogs and treat them like garbage. Then when they are aggressive throw them away or turn them loose. I agree. It is a shame! I don’t know how aggressive his dog was all I know is that she growled at me. It’s very irresponsible (and heartless) to let your aggressive dog go free in the neighborhood because you don’t want them anymore. I know. You would think you would have an attachment to the dog. It’s so cruel to let them go to fend for themselves. Probably to end up being picked up by animal services and be put down. Well, not probably. If the dogs are aggressive they are automatically put down. At that time our shelter wasn’t a “no kill” shelter. Since then it has become one. It would be nice to know they rehabilitated this dog and found her a good home with someone who cares about her. Your shelter may get help from Best Friends Animal Rescue (they are in Kanab,UT) They are huge in spreading the “no kill”movement. That certainly is possible! I’m very happy they have finally become a no kill shelter. Of course, that doesn’t mean that some of the animals aren’t put down. I’m sure you are right about that. I know that with some illness are infectious to other dogs and the dogs have to be put down to keep the other dogs from being infected (Parvovirus, for instance). Cats that have Feline Leukemia have to be put down for the same reason. I’m sure there are other illnesses too that I’m not familiar with. Also, as you said, those dogs (or cats) with special needs are difficult to find homes for. That’s right. I forgot about diabetes. I imagine there are a lot of pets that have this disease that no one will adopt because of the expense. I use to go to the shelters and foster a dog and try and find that dog a home. A few of them I adopted and a few of them I found homes for. My wife always talks about fostering but she knows she’ll get attached to the dog. There’s a couple that we could cycle dogs fairly quickly if they are healthy. But my wife is the one for the hardship cases. I understand your wife! That’s why I had to stop fostering. The owner wants the old dog or cat or the APL? Oh, I see. You ended up not being able to get the cat? We never went back to the APL either. It’s crazy that if we lied about the dog, it would have gone home with us. Wow, that’s too bad they wouldn’t give you the cat because you had a dog. And the people who gave the cat up said so. Well, it’s sad that the cat probably got put down because the owner saying it couldn’t be with a dog. this is the sweetest story PJ! i love dogs and rescue them and i am sucker for fluffy ears and soft fur. i like that you were so sweet to name him/her! Thank you Gina! It was a fun story to write. Oh yes well done Joy…..we had a bird once that gave us cause to change its name to the female version when she laid an egg…. Hahaha! That’s funny Michael! She was a he until she laid an egg! LOL! Cute and funny story. Heartwarming. Thank you! I’m getting ready to go read your story. This time I will know that it isn’t for Friday Fictioneers. LOL! I feel so bad about that happening. Thank you for being so nice about it. Thank you Izzy! I really appreciate you saying that! Thank you Deb! Yes, Marley ended up being Marlena! LOL! Thank you! Thank you so much Jacqueline! It was fun to write. Thank you so much Elleseth! All is well with me and I hope all is well with you too! Hahaha! I bet the vet had a good laugh over that! I had a little dog named, Poopsey. She was a great little dog! Thank you for your kind comment!